In the past few months, because of my work with the SSATB Think Tank on the Future of Admissions Assessment, both of the above questions have arisen multiple times during my presenting, discussing, and consulting about NonCognitive assessment. For both, I’ve been working on developing better answers, and– wow– the University of Chicago CCSR report embedded atop is a tremendous asset and resource for answering and addressing both questions. The report came to my attention by being discussed, and indeed, celebrated at not one but two conferences I attended back to back in April, the Deeper Learning Network Conference at High Tech High in San Diego and the National Partnership for Educational Access in Boston. But as much as I had heard it praised, it nevertheless exceeded my expectations. This is a masterful overview and analysis of what matters among non-cogs in the service of supporting our students success to, through, and beyond secondary schooling. Back to to the two top framing questions. First, how can we best organize logically and coherently the array of attributes and activities that are aswim in this conversation? In conversation recently with Angela Duckworth, she guided me toward what is a useful simplification, though really almost too much of an oversimplification, which is the same one used by the National Research Council in its highly valuable 2012 report, Education for Life and Work. 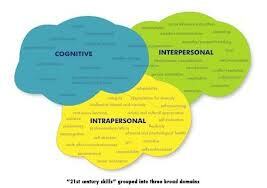 As stated, it is very simplified, but still useful: there are three domains, and we need to think about how we are recognizing, understanding, teaching and assessing each of them: Cognitive, Interpersonal, and Intrapersonal. Onto the second question: what do we know about the malleability of these factors, and what is the best approach to teaching the one most currently being talked about, grit or perseverance. The answer is in the graphic above, and I could just leave it at that, but at least for my own sake, let me spell it out. The report takes the issue of malleability very seriously– ultimately that is the purpose of this report, to scan and survey the Noncog terrain and report back where we should put our focus to make the most difference. Of all the challenges posed by the implementation of the Common Core State Standards, this may be the greatest: if we are truly to be a nation of college-goers, we must not only raise the bar on what students learn but we must also leverage an understanding of noncognitive factors to teach adolescents how to become effective learners. In the absence of developing students as learners, current reform efforts are unlikely to succeed at increasing students’ readiness for college. 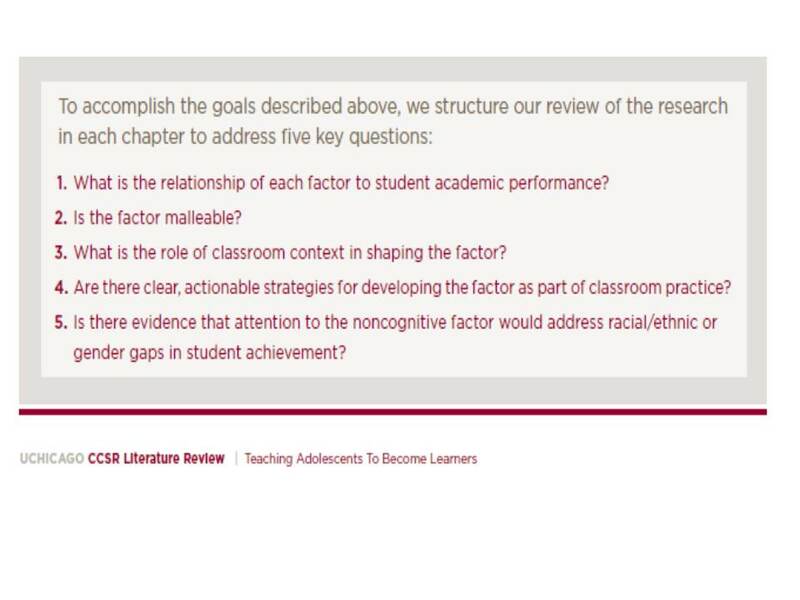 Our goal was to develop a coherent and evidence-based framework for considering the role of noncognitive factors in academic performance.. [and to] summarize the most promising levers for change. So what do they conclude? This is the really interesting part, and it is entirely worth your time reading closely. Academic Behaviors make for great academic performance, but this is almost self-evident: students who do their school-work and come to class will do much better than those who don’t. But these behaviors, in and of them-selve, are not so malleable, and don’t deserve the primary focus for intervention. What about grit? When meeting with Duckworth last month, I understood her to say she sees grit as reasonably malleable and as a overlapping considerably,though not equating to, optimism and the growth mindset. The authors here distinguish grit from the mindsets, and then argue that grit as a whole, across multiple domains, is effectively equivalent to one of the Big Five set of largely fixed personality traits, that of Conscientiousness. Hence, grit itself is not very malleable. While Conscientiousness increases across the lifespan as individuals mature, psychologists generally agree that Conscientiousness is a “fixed trait,” meaning that there is little evidence that interventions or environment can substantially change this aspect of a person’s basic nature (Srivastava, John, Gosling, & Potter, 2003). Duckworth and colleagues (2007) suggest that grit should also be understood as a stable personality trait—perhaps a mistakenly overlooked facet of Conscientiousness. This does not mean that it is impossible to change a person’s grittiness but rather that doing so would be difficult. But, the authors say, when we set aside the idea of a trait which is consistent across many domains, we can identify a specific aspect of grit, which they call academic perseverance– which is far more malleable. our focus here is on academic perseverance rather than perseverance in some general sense. When we make this distinction, the answer to the question of malleability in a given context becomes a resounding “yes.” There is significant empirical evidence that students demonstrate different amounts of perseverance at academic tasks under differing conditions, supporting the idea that academic perseverance as a behavior in a specific context is highly malleable. But, there is a major caveat, and this is the million dollar point in answer to the second question atop the post: There is little to no research support that we can be effective intervening to improve grit, or academic grit, or academic perseverance, directly. We can’t teach grit itself. We can develop grit, however, by developing two areas which are very responsive to intervention, and which, together, build and develop academic perseverance: mindset and learning strategies. The literature suggests two distinct pathways: supporting positive academic mindsets and helping students develop effective learning strategies. There is clear research evidence that students’ mindsets have strong effects on their demonstration of perseverant behaviors such as persistence at difficult tasks. When students value the work they are doing, feel a sense of belonging in the classroom context in which they are working, feel capable of succeeding, and believe they will master challenging material with effort, they are much more likely to engage in difficult work and see it through to completion. With the knowledge that the maximum opportunity for influence is on mindsets and learning strategies, it is good to see the useful information provided in each of these sections. Mindset is a familiar one for me: I count Seligman’s trilogy– Authentic Happiness, Learned Optimism, and the Optimistic Child– and Dweck’s Mindset as among the very most important books, personally and professionally, I’ve read in the past twenty years. Mindset is broken into four core beliefs and perceptions, which, now more than ever, every educator should take seriously as among their core responsibilities to affirm, support, and develop in every student. Every student, every day, all four: are we supporting and advancing these student beliefs? The manner in which a child views an aversive event, such as failure, determines, in large part, the way in which he reacts to that event. Specifically, if a child believes failure to be a result of his lack of ability or a result of external factors beyond his control, he is unlikely to persist in his efforts. On the other hand, if a child believes failure to be a result of his lack of motivation, he is likely to escalate his effort in an attempt to obtain the goal. The fourth is so important, and so aligned with so much of what is important in 21st century learning: providing greater transparency for every learning event for every student: what is the value of this learning, how can we apply it to things which matter to us, what is our personal and emotional connection and stake in this material? These things are no longer just “nice to haves” but they are essential to the development of the mindset which leads to the perseverance which leads to the academic behaviors which make possible successful academic performance. Learning Strategies are also essential, and are also highly malleable. Learning strategies encompass several related psychological processes: metacognition, self-regulated learning, time management, and goal setting. Together, these concepts constitute a group of learner-directed strategies, processes, and “study skills” that contribute to academic performance. First, learning strategies involve metacognition, defined as an individual’s knowledge of and control over his or her cognition. A second and related point is that students learn more effectively when they monitor their own learning processes, determine when they are having difficulty, and adjust their behavior and/or strategies to tackle the task at hand. I especially appreciated the explanation about strategies student can develop, and teachers should support students in developing, for deepening understanding. While learning strategies generally involve metacognition (monitoring one’s understanding) or organizing time and resources (setting aside an hour with the TV turned off in order to read), other strategies are entirely cognitive and have the express purpose of increasing a student’s understanding or transferring information into memory. Weinstein and Mayer (1986) identify three such subcategories of cognitive learning strategies: rehearsal strategies, elaboration strategies, and organizational strategies. Generally, the more a learning strategy involves manipulating or organizing material rather than just reviewing it, the more likely it is to result in deep understanding. Are we doing enough as educators to develop these strategies? How explicitly and emphatically are they taught? I know there are many fine educators who frown on tests and end-of-semester exams, but I think that they have value in many ways, and one of those ways is the opportunity the present to focus student attention on study skills and learning strategies. The exam is in two weeks: how should we review for it? Let’s set goals and plan a schedule for managing time in our studies; let’s figure out how we figure out what we know already and what we need to learn better; let’s try different study techniques and determine which works best for our style of learning; let’s conduct practice tests and then work on applying what we’ve learned to new challenges; let’s intentionally do something a bit too hard, make mistakes, and learn from those mistakes. This is the course that is is so important: Mindset and Learning Strategies are highly malleable and can be taught directly; they will then be the difference to the success of so many of our students, and that success instill confidence and reinforce mindset, leading to an academic perseverance which results, ultimately, in greater academic performance. No, we don’t/can’t/shouldn’t teach grit directly, but we can greatly and positively change it for the better in every one of our students. Read the report atop– add it to your summer reading– it is a great asset to the field of teaching and learning in the 21st century.